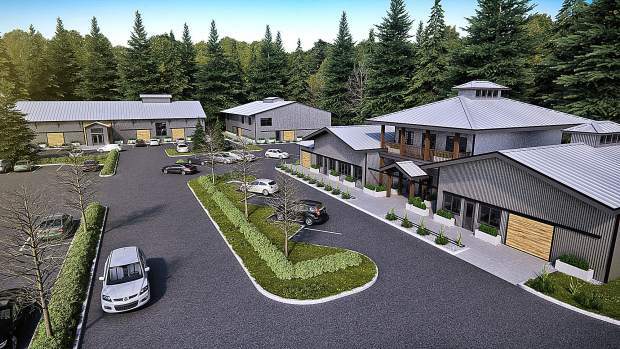 An artist rendering shows what will become a "cannabis campus" in the space formerly occupied by South Yuba Club in Nevada City. 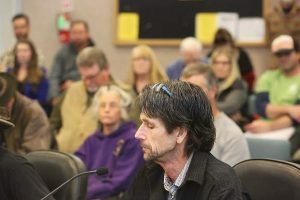 It’s been in the works for more than a year, but a proposed “cannabis campus” is taking shape now that the principals have closed escrow on the former South Yuba Club property in Nevada City. The two buildings in the 500 block of Searls Avenue, which have been vacant since the health club facility closed in November 2017, will house up to six businesses and will join Elevation 2477’, the county’s first medical marijuana dispensary, to flesh out a “cutting-edge multi-tenant cannabis campus,” said project manager Maria Herrera. The 2.29-acre parcel in the Seven Hills district was purchased by a group of investors and will be managed by Lab Properties, an affiliate of SBMI Group. Those investors last year also acquired the adjacent property where Elevation 2477’ opened in August. The two buildings total 17,210 square feet and each will be divided into a maximum of three units each, Herrera said. Both will require substantial renovation and retrofitting to, among other issues, upgrade the electrical and HVAC systems and become ADA-compliant, she added. The building design is being handled by Richard Baker of Siteline Architecture, who did the work for Elevation 2477’, in order to keep the same look and feel throughout the campus. According to Herrera, one reason it took so long to finalize escrow was that the principals wanted to make sure that if permit applicants were in compliance, they would be able to renew their permits without worrying that — for instance — a childcare business would move in and cause them to lose that ability. The delay has been advantageous in other ways. Herrera said she saw would-be cannabis entrepreneurs rushing to get into spaces without knowing what it takes to get through the permitting process and build out a space that will meet compliance requirements. And that’s left a niche that Lab Properties is confident it can fill with turn-key spaces. “The advantage here is a collaborative ecosystem,” Herrera said, adding that Lab Properties will be able to provide much-needed guidance to prospective tenants. Escrow officially closed on the properties at the end of October, and the goal is to have the build-out complete by October 2019. “We’re in the leasing process now,” Herrera said, adding that she already is meeting with prospective tenants and expects to have the campus fully leased by the end of the year. From the tenants’ perspective, having a premise locked in is key. They have to have the space for the business before they apply for a permit from the city, Herrera explained. Plus, the business cannot get a state license until the build-out is finished. So in order to get a provisional license in 2019, applicants need their temporary license this year — or they will have to apply for an annual license next year, which could take as long as six months to process. 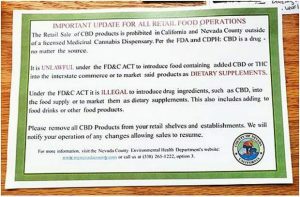 The lag time since adult-use cannabis was legalized has allowed Lab Properties not only to watch how the state regulations are evolving, but to be more discriminating about its future tenants, opting for those who have building plans, knowledge of the industry and sufficient capitalization, Herrera said.